The hat tricks weren’t discussed. Not by Duluth East coach Mike Randolph, not by playmaking sidekick Chris Locker and certainly not by Dave Spehar, the Hat Trick King himself. “It wasn’t a shock, to be honest with you,” Locker said about Spehar’s incredible goal-scoring feats at the 1995 state tournament. “The bigger the game, the bigger the stage, the better we played. That was especially true with Dave. 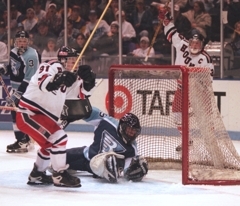 At the 1995 state tournament, Spehar scored three goals in the first period of the Greyhounds’ 5-0 rout of three-time defending state Class 2A champion Bloomington Jefferson. In the semifinals Spehar again scored three goals in Duluth East’s 6-2 triumph. As the grand finale to one of the most memorable performances in state tournament history, Spehar completed the hat trick trio by scoring three goals in Duluth East’s 5-3 win over Moorhead in the championship game. One of Spehar’s goals came on a penalty shot in the third period. It proved to be the game winner. Indeed, the 5-foot-7, 170-pound Spehar was a rare talent. “That guy could score from a phone booth,” said Mark Parrish, the former Bloomington Jefferson standout who was on the Jaguars team that was stunned by Spehar and the Greyhounds. 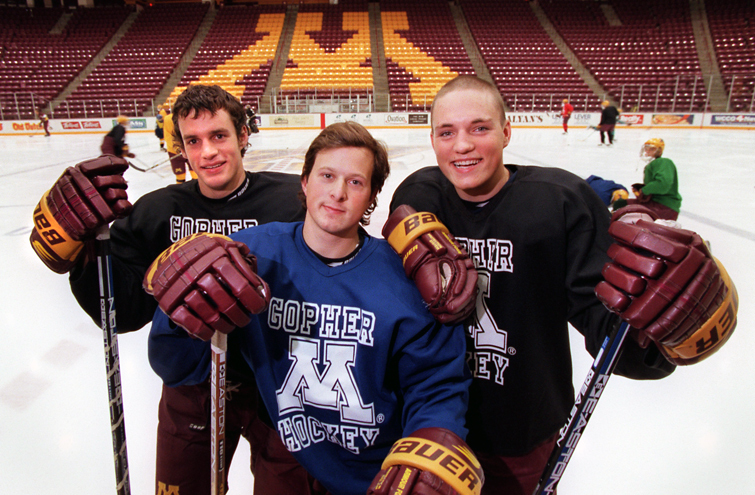 As a kid Spehar spent 12-hour days at Duluth’s Glen Avon outdoor rink. Spehar’s parents worked opposite shifts, so mom and dad would stop by on their way to and from work. Spehar made the Greyhounds’ varsity as a freshman, when he scored 46 points. 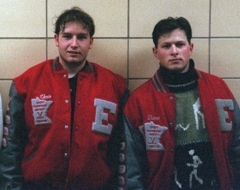 He scored 56 points as a sophomore and was named to the all-state tournament team in 1994 when Duluth East placed third. Spehar racked up a stunning 102 points as a junior during the Greyhounds’ 1994-95 championship season. “In 1995 it was exciting, it was awesome, it was great, but on the bus ride home it was like, ‘We have to repeat,’ ” Spehar said. 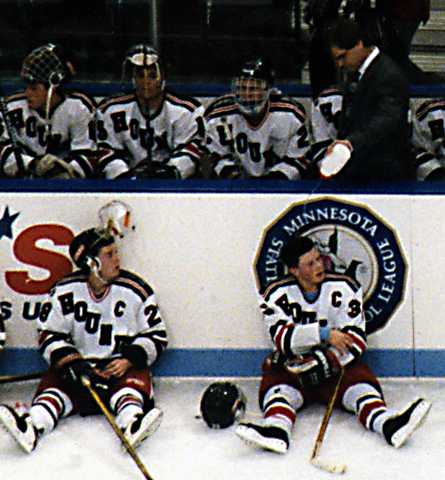 Duluth East was 23-2-0 heading into the 1996 state tournament, where it routed Blaine 7-1 in the quarterfinals behind four goals from Spehar. In one of the greatest – and longest – games in state history, Spehar and the Greyhounds went end-to-end with Apple Valley for a game that extended into a fifth overtime before the Eagles pulled out the win. Spehar and longtime linemate Locker each had numerous prime scoring chances in the overtime periods, but Apple Valley goaltender Karl Goehring was there to make spectacular save after spectacular save. The Eagles won 5-4 on a goal by Aaron Dwyer 2 minutes, 12 seconds into the fifth overtime. “After that game it was over for us, the tournament was over,” Spehar said. “We got back to the hotel at something like 3 a.m. So we didn’t really go to bed. The Greyhounds, even with their spirits crushed and their emotional tanks on empty, still had the obligation of playing the third-place game against South St. Paul that afternoon. Amazingly, Duluth East beat the Packers 9-2 as Spehar had three goals and three assists to reach the 100-point plateau for the second straight season (he finished with exactly 100 points). “He had a unique mind for the game, he was a kind of a step ahead of everyone mentally,” said former Duluth East defenseman Dylan Mills. “He would do the unexpected from the other team’s standpoint. Spehar was named to the all-tournament team for a third consecutive year and finished his career with 20 goals and nine assists in nine state tournament games. Only Eveleth’s John Mayasich, with 46 points in 12 games from 1948-51, has more state tournament points. Spehar is one of just three players in state history to score more than 300 career points. His 304 points ranks third behind Ben Hanowski of Little Falls (405) and John Pohl of Red Wing (378). Spehar’s 166 career goals is the fourth-highest total in state history. He is one of just two players, St. Francis’ Joey Benik is the other, to score 50 or more goals in a season twice. 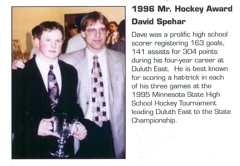 “We had a tremendous group of kids, all the way up from the time we were Pee Wees,” said Spehar, who won the Mr. Hockey award in 1996. “We all understood our roles. That’s just what I did. I just tried to go out and score goals. Spehar played four seasons at the University of Minnesota. 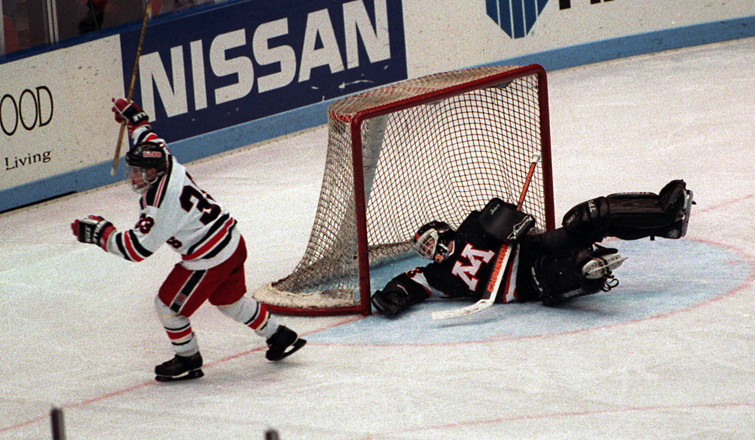 He scored 61 goals and totaled 129 points in 160 career games. Spehar, who never played pro hockey, works as a derivatives trader for US Bank Equity and lives in Excelsior with his wife Rebecca and their children, Sam, 4, and Finn, 2.